So. You are an atheist eh? Do you claim this in front of your parents as well or only your peers? Which one of the following lines do you agree with? 1. I don’t believe in religion. 2. I don’t know if God exists. 3. I don’t care if God exists. 4. I don’t believe in God. You are an atheist only if your answer was 4. In recent years , the number of people claiming to be atheists has risen. The reasons remain dubious though. How many of them are truly atheists? Your guess is as good as mine. When youngsters claim to be atheists, their parents try to discourage them, send them on guilt trips, force them to attend religious events ( I know a friend who was forced to chant verses from the Gita in his missionary school when he told his parents he wasn’t a believer.) and if all this fails, then they dismiss it as a rebellious phase. 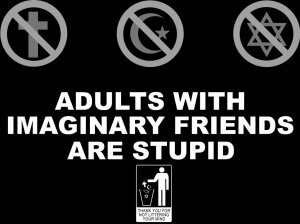 Being an atheist is not a walk in the park. For one, people don’t take you seriously if you are young. If God forbid (pun intended), you are taken seriously, then you have to face disapproval from all sides. Parents, people and general society. They treat you with a condescending attitude and say ‘May God bless you’ to you whenever you meet. Not to mention feeling like an outcast during each and every religious festival. I almost agree with this line I came across on Facebook : ” Being an atheist today, is like being homosexual in the 1980s”. But this is just the others’ reaction. What about you yourself? Can you accept the fact that there is no superior being watching over you? Can you live with the fact that there will be no Judgement Day? No Big Brother to right all wrongs? No 72 virgins waiting for you? People like the idea of faith. They need something or someone to believe in. To depend on. God is the most common object of dependence for people. Here is an excerpt from a Mitch Albom book which I read recently. The rabbi is talking about his doctor, who was an atheist. “So I go to his house, and he sees me. I can tell he is upset. I tell him I am sorry for his loss. And he says , with an angry face, ‘I envy you’. This is worse than an unanswered prayer. It is far more comforting to think God listened and said no than to think that nobody’s out there. Because of religious warfare, people have started renouncing God instead of renouncing religion. God might not be a creation of religion. Religion might have been created to define God. There again is the difference. I think people cannot be trusted to do the right thing. That is why we don’t have anarchy. People don’t understand the concept of live and LET LIVE. That is why we have religion. I think religion was invented with the aim of guiding the people to understand the difference between right and wrong through the medium of God who is portrayed as an omniscient, omnipotent and omnipresent being. Earlier people feared Him and did what was said in the scriptures. Now the purpose of religion has changed. It’s interpretation has changed. It has become a factor of your identity. It has become a cause of war. To top it all, science came in to put God’s existence in doubt. But you know what this means? It means the people who introduced the concept of religion were the original atheists. Ironic eh? P.S. : I just wished they’d had some foresight. You blabber a lot but end up saying nothing of importance love. That depends upon the perspective. Up there is always lonely. So, no thanks. Too bad its not for you. I am where I belong and where I want to be for now. Maybe people who made religion truly did believe in god and later saw that people can be oriented using it. Back to ur blog after a long time...merry Christmas!